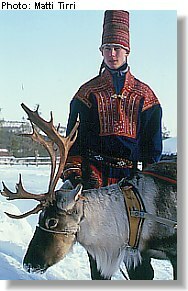 There is no question that in the Sámi culture, there are few things as important as the reindeer. They have been a source of food, clothing, shelter, and inspiration from time immemorial, as well as occupying a central position in ancient Sámi shamanism and iconography. The reindeer and the Sámi have sustained one another. Though the importance of the reindeer has changed little for the Sámi over thousands of years, the particular role played by the reindeer has changed as Sámi society has changed and been forced to adapt to Western incursion, absorption, assimilation, and appropriation. In order to understand the role of the reindeer in the present-day Sámi and Finnish societies, especially in the complex arena of environmental politics and legislation, one must first understand the historical processes that have shaped this current configuration. It was a very slow process for the Sámi to go from hunting only wild reindeer to herding their animals with snowmobiles and helicopters, and turning a sizable cash profit each autumn in the process. The hunter-gatherer period of Sámi history is still characterized by dependence on the reindeer, but in a different way than that of later epochs. “Deer were tamed for use as beasts of burden, providers of milk and decoys in connection with an economy based on the hunting of their wild counterparts.” (Ingold 1976: 17) The deer were cohabitants of the Sámi’s sphere of existence and as such both Sámi and reindeer were mutually dependent on one another. The system of subsistence based on hunting and gathering was a very stable one. Each population could neither rise too far above nor fall too far below the level of its counterpart. There was little danger of a massive shortfall of resources, and both animal prey and human predator coexisted in a state of near equilibrium, but it was a relationship that was destined to change. Settlers moved in and wanted to trade goods for reindeer, and the Sámi population was growing; in short, it was the first economic pressure they had ever faced. This scarcity of pastureland and low calving rate made way for the introduction of the snowmobile into Finnish reindeer herding. The snowmobile was first introduced to Sámi herders in Finland in the winter of 1961, and it quickly revealed the advantages it had to offer. A herd of sixty-five reindeer could be collected and driven by a single man on a snowmobile, which would save thousands of man-hours for the herders. This technology was supremely useful when lichens were scarce and the herd had to be driven far in search of food, or even when the snow machines were used to supplement the reindeers’ diets with hay and other farm-raised foodstuffs. But in the long run, the snowmobile signaled the final death knell of intensive herding. The snowmobile was an expensive machine, so herders with a lot of capital bought them first. The smaller herders were gradually driven out of competition and forced to join a larger herding conglomerate or face unemployment. This eventually produced a concentration of big herding operations at the expense of many smaller ones. This restructuring also unbalanced the Sámi herding community economically, creating a class gap, wealthy and poor, dominant and non-competitive. Lastly, the snowmobile produced a much higher rate of slaughter of deer for sale, risking the stability of the herd. Tim Ingold observes that “whereas pastoralism recommends a man to slaughter only the minimum of deer needed to maintain his family, stock-rearing requires him to leave alive only the minimum needed to maintain his herd… The definition of stock-rearing obviously implies that meat is to be produced primarily not for subsistence but for sale and export, and therefore assumes the existence of a fully developed market structure as well as the acceptance of commercial values.” (Ingold 1976 p.89) Thus, the Sámi herders in Finland were flung headlong into the modern cash economy and forced to adjust nearly every aspect of traditional reindeer herding to fit the new paradigm. The reindeer had now been utterly commodified, had no meaning left save as an economic unit. The issue of land rights of the Finnish Sámi is one of those thorny issues, and it is intricately and inexorably tied to the reindeer herding industry, both in Sámi politics and national Finnish politics. In 1990 the Finnish government failed to ratify the 1989 ILO Convention Nr. 169 Concerning Indigenous and Tribal Peoples in Independent Countries, which would have formally recognized the Sámi’s claim on their homeland, because they did not acknowledge “the rights of ownership and possession over the lands which they traditionally occupy.” As of November 1998, the Finnish government was still studying the conditions of ratification. (Tirri 1999, (http://virtual.finland.fi/finfo/english/minorit3.html) The reason these ownership rights cannot be acknowledged is that the Finnish government claims ownership of virtually all (over ninety per cent) of the Sámi homeland (Sámiid ruovttuguovlu) with no solid legal grounds for such an ownership claim. Hence, no lengthy investigation of the matter is likely to be forthcoming from any governmental source. (http://www.netti.fi/~samedigg/SAAEN.htm) When it comes to land use and land management policy in Finland, there is a constant conflict between the government and the Sámi for the following reasons: the government wants to limit reindeer herding and put forth its own agenda of land management, whose laws are often found to violate the Sámi’s human rights. On the other side of the fence, the Sámi want to practice reindeer herding unbothered, but unrestricted and rampant reindeer grazing decimated much of the Finnish pastureland in the 1960’s and 1970’s. Finding a balance between land management concerns and Sámi cultural and economic concerns is a very delicate matter, and not always easily resolved without outside arbitration. One tactic that the Sámi have begun to employ with a modicum of success in their dealings with the Finnish government in recent years is appealing to international human rights organizations like the Human Rights Committee when they find themselves running into brick walls in the domestic bureaucracy. 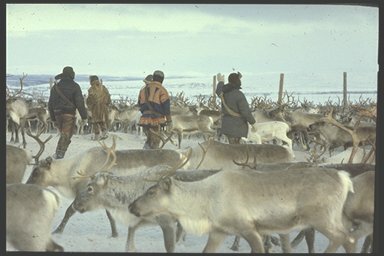 For example, in October of 1994, a reindeer herder named “Ilmari Lansmann and forty seven other members of the Muotkatunturi Herdsmen’s Committee submitted a communication claiming a violation of article 27 by the Government of Finland.” (http://www.atsic.gov.au/issues/international/un/1_3.htm) Lansmann and the other herders were upset by a Central Forestry Board decision to award a quarrying contract to a mining company in Sápmi. The herdsmen claimed that the quarry would disturb their herding activities, which were a crucial part of their cultural identity, and that the mountain itself should not be quarried because it contained several sites that were considered sacred by the Sámi. Finland countered by saying that the Sámi had not yet exhausted all domestic avenues for the redress of their grievances. Thus, human rights have become a battleground, and the battle is often waged with semantics, but the stakes for the Sámi are very high, indeed. Article 27 of the ICCPR protects the cultural rights of minorities by giving them an international forum to discuss their concerns. In the final analysis, the extensive herding model may not even be anywhere near what could be called sustainable as a means of economic livelihood for the Sámi in Finland. Today, many reindeer herders in Finland work as employees of large herding conglomerates that can afford the modern technologies necessary to the business, and still have to supplement their incomes with other sources, such as handicraft sales and tourism, in order to support their families. Though extensive herding may only be a stopgap solution to the economic problems of today’s Sámi, it is the only viable option in a modern cash-based economy. A return to intensive pastoralism is both impossible and unsustainable in the marketplace. Many Sámi reindeer herders open their reindeer farms to the public and subsidize their incomes with both tourist dollars and through the sale of Sámi handicrafts to the tourists while they visit the farm. Some examples of reindeer tourism include a veritable plethora of reindeer farms that are accessible to tourists almost year-round in some cases. The Inari Reindeer Farm boasts a capacity of one hundred fifty visitors during the summer and one hundred visitors during the winter months. Visitors are served coffee out of wooden cups, traditional Sámi game dishes, and the program concludes with the singing of traditional joiks. The Inari Reindeer Farm also offers a “reindeer safari” that travels by sled, and visitors can earn a “reindeer driver’s license”. The Inari Reindeer Farm has a well-presented website and advertises with the Finnish travel bureau (http://www.urova.fi/home/sakk/paadeng.html) The Purnumukka Reindeer Farm (http://www.urova.fi/home/sakk/purnume.html) also offers reindeer safaris and driver’s licenses. Lea Magga, one of the owners of Juhani and Lea Magga’s Reindeer Farm (http://www.urova.fi/home/sakk/leaeng.html), is “one of the former semi-nomad Sámis. Thus, she has vivid personal memories of this migratory way of life that the Sámi have by today given up.” Utilizing tourism as a means of economic support has necessitated the adoption of modern business practices by the Sámi reindeer herders, including travel advertising and having a strong electronic presence on the Internet. The Sámi herders’ ability to quickly adopt these modern business practices is just one example of the bicultural competence that is requisite for an indigenous people living in a modern post-colonial context within a larger group. A definite fringe benefit of this phenomenon of bicultural competence is a greatly increased effectiveness of Sámi advocacy and political action. Electronic media make it that much easier to link together a geographically dispersed people like the Sámi. But does this tourism phenomenon marginalize the Sámi? Does it trivialize the culture that worked so beautifully for thousands of years. Perhaps not, perhaps the Sámi will adapt as they have always seemed to do in the past. After all, the world of the modern Sámi reindeer herder in Finland is familiar ground. Pushed to the margins by the dominant colonial society and forced to adapt, Sámi society has responded as best it could to changing marketplace conditions and emerging economic pressures, all while battling the Finnish government over land use and fighting for the preservation of the Sámi culture alongside the preservation of Finland’s natural environment. As several Sámi herders have brought to the attention of the international community, at some point maintaining one’s cultural identity is a human right that cannot be sacrificed on the altar of fiscal practicality. Through their perseverance and resourcefulness, the Sámi are leading the way in hashing out the role that indigenous cultures worldwide will play in the Information Age, now and for years to come. Ingold, T. The Skolt Lapps Today. Cambridge: Cambridge University Press, 1976. Williams, Scott. “Herding Systems in Transition: Sami Reindeer Herding in the Modern Era.” State University of New York, Dept. of Anthropology: Albany, NY.